I’m writing this blog post after a long day at work. Like many of you, I work full-time at a standard 8-5 job. At the end of the day, I want nothing more than to come up and curl up on the couch with my cat. In a perfect world, I wouldn’t have any chores to do, emails to answer, or posts to write, but it is what it is. Even though I’ve worked all day, I know I can’t rest the minute I open the door to my apartment. There’s still work to be done. You know how it is: you get home from work, grab a snack and a drink, plop down on the couch, and turn on the television. Next thing you know, you’re three hours into your House of Cards binge and you haven’t eaten dinner, fed the cat, or gotten any of the items crossed off your to-do list. You swear you’ll accomplish everything tomorrow. The next day, when you get home from work, you grab a snack and a drink, plop down on the couch, and repeat the whole cycle. You know you’re wasting your life, but you can’t help it – or so you think. That’s where I come in. No matter how set in your ways you might be, I promise you that you can change your routine. How do I know? Because I’ve been there. When I started this job (my first real full-time gig), I could barely keep my eyes open throughout the day, much less continue to be productive once I got home. Soon I realized that if I didn’t change my habits, I would never be able to accomplish my goals. I took a hard look at myself and took the plunge. Now, I work a full-time job, run a blog, post on social media, film vlogs, and work on my novel – all while managing to keep the apartment in an organized state of chaos (caveat: my chaos is much cleaner than most people’s). So how did I manage to turn things around? The biggest change I made was to turn off the TV. I already wrote a post about turning off your television, but I didn’t emphasize how it helps your productivity. For me, TV changes my whole mindset. Once I turn it on, I’m done being productive. I can say “only one episode” all I want, but we all know it’s easy to get sucked in to Netflix. See how long you can go without turning on the TV. Make it a game. Each day, try to beat your personal best. You’ll be surprised how much time you have now that you’re not glued to the screen. With your new free time, you can read, write, or even do some chores around the house. Try it for yourself and see how much more productive you can be. You’ll cut down on distraction, earn some peace and quiet, and carve out a few more minutes to do what you’re passionate about. 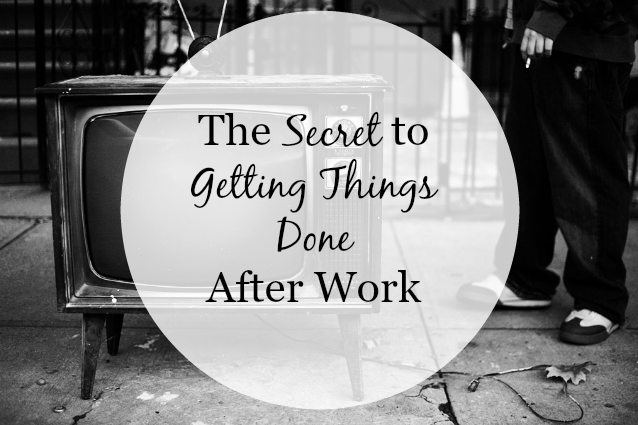 What are your secrets for getting things done after work? What do you think about avoiding the television?